Bride and groom at St. Peter's Catholic Church in Laporte, Indiana. We all knew there were possible storms brewing on Kelly and Danny's wedding day. Thing was, the joy and laughter and smiles won out. Also, we had a determined bride and groom and I'm a determined photographer. Like mail delivery, neither rain nor sleet and snow was going to stop us. The day began at The Blue Heron Inn right off the lake in LaPorte. The girls were in high spirits as MUA's and stylists from LeRoc were on hand to bring out the beauty. Wedding day fun in LaPorte, Indiana. St. Peter's Catholic Church has some wonderful architecture and the priest was very gracious in giving us free reign to capture this glorious ceremony from all angles, including the tall balcony. Wedding ceremony at St. Peter's Catholic Church in LaPorte, Indiana. Wedding ceremony photo collage of St. Peter's Parish. We had entered the church for the ceremony at 2pm and by the time we exited an hour or so later, the temperature had dropped by 30 degrees and storms were brewing. the newly married couple made a quick dash amid bubbles and then back inside for family photos. 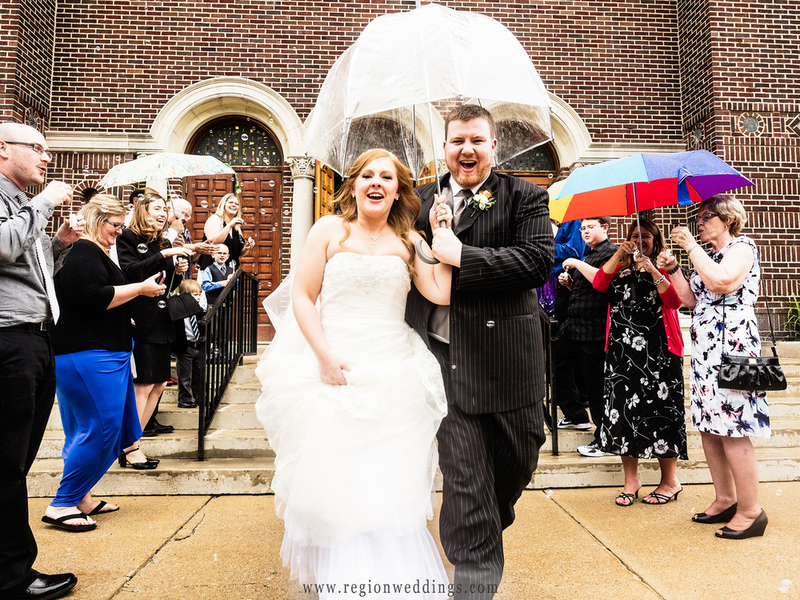 Bride and groom exit the church amidst bubbles with an umbrella to keep dry from the rain. After the last of family pictures were taken, we headed out to the lake where fog had overtaken everything. Rain was pelting us from all sides and the temps were chilly. Still, Danny and kelly remained in good spirits. I think I muttered "you only live once" and they agreed. Their adorable son, the ring bearer and the flower girl got to it out the outside shots. They were all smiles inside for their photos. 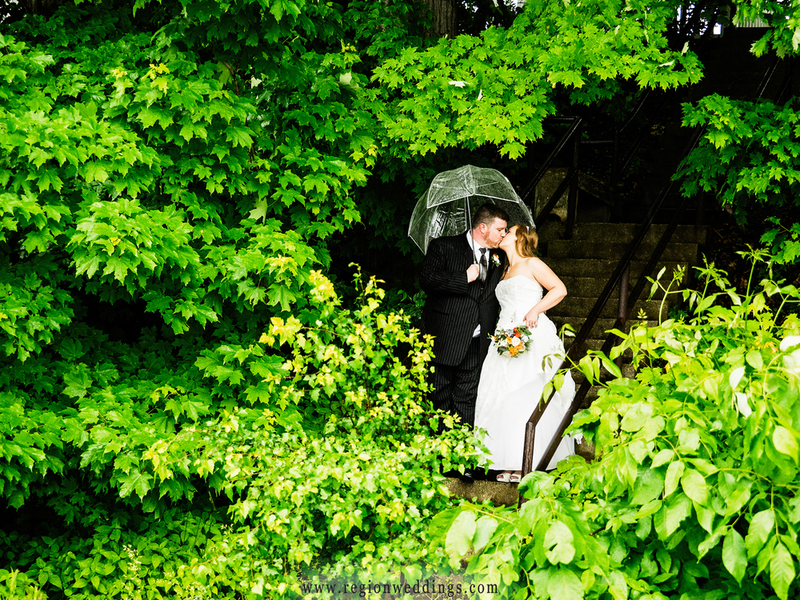 The bride and groom brave the rain for their wedding photos. The reception took place at The Allure and the venerable ballroom did not disappoint. The ring shot below sums up the mood and i was pleased to see the Wish Book that I made for the couple from their engagement session on display and being signed by guests. A photo collage of a wedding reception at The Allure. 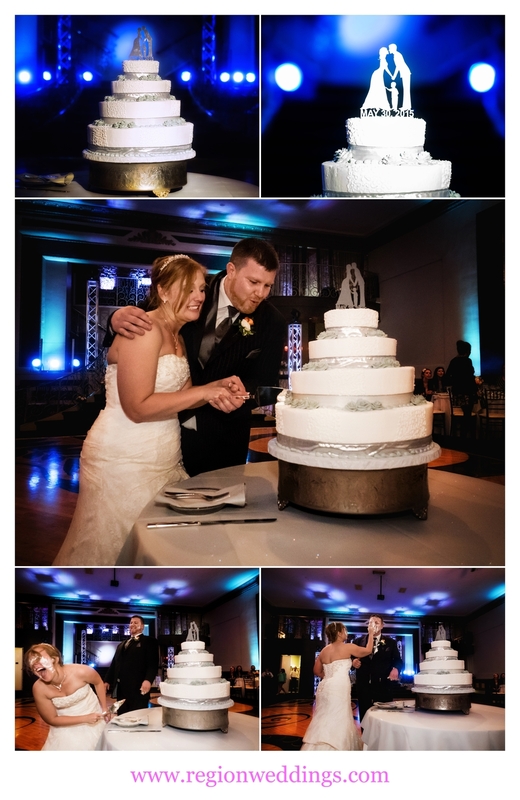 The bride and groom cut the cake at The Allure during their wedding reception. As you can see from the above images, the name of the game was fun and the bride and groom set the tone with their cake smashing. Hey, after getting pelted by rain earlier, why not!! The dance floor was packed all night and the groom even took over the microphone for a vocal performance as the crowd cheered him on. The groom performs during his wedding reception. Kelly and Danny booked me last year for their late May wedding. If you would like to secure your date for next year, please fill out the Contact Form. I promise to get back to you right away. I hope you have enjoyed this sneak peek look at this fun couple's wedding at St. Peter's Catholic Church in LaPorte. Stay tuned to the social media listed below for more images.